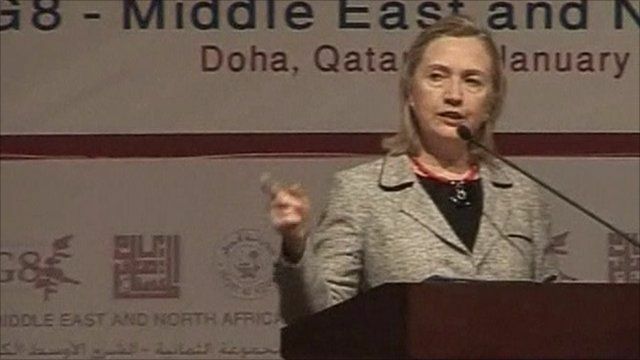 US Secretary of State Hillary Clinton delivered a warning to Arab leaders that the growing unrest in the region will only get worse if they do not install economic and transparent political reform. She was speaking in Doha at a gathering of leaders from the Arab world and said the growing threat of extremist elements was a concern saying "if leaders don't offer a positive vision and give young people meaningful ways to contribute, others will fill that gap". Her trip comes at a time of great unrest in the Middle East, with weeks of violent protests in Tunisia continuing against the government, which has so far left 23 dead.